Compiled by Tomato, info and pics provided by EXCELSIOR! 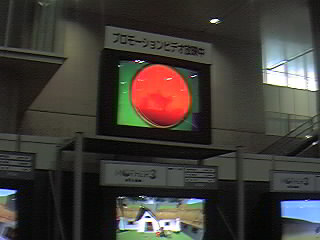 EXCELSIOR!, who lives in Japan, went to Spaceworld '99 and managed to get quite a lot of pictures and information. EXCELSIOR! kindly allowed Starmen.Net to use these pictures. For that, we are in his debt. The informaton included with each picture is not a direct or complete translation of EXCELSIOR's information, but it is more of a summary. Personal notes and thoughts are written by Tomato. 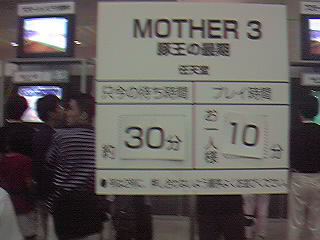 Here we see the line for people who want to try out the playable demo of Mother 3. Players were only allowed 10 minutes at a time. 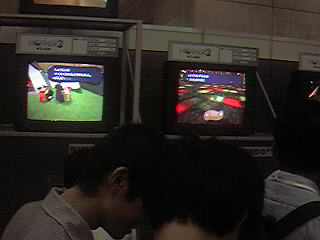 From this picture, it appears that the average wait to get to play was 30 minutes. 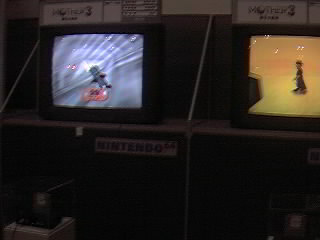 Much less than the hour-and-a-half lines at other places, like the DK64 section. EXCELSIOR played it twice, for a total of 20 minutes. 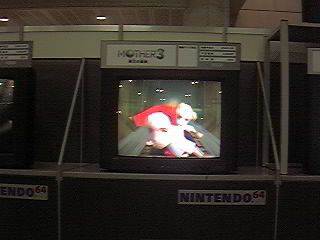 Here is a picture of some Mother 3 characters displayed in the Nintendo Spaceworld Guide Book that everybody got as they entered. 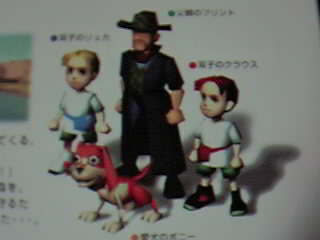 This image includes the twins, Ryuka and Krause, their father, Flint, and their dog, Boney. Here is the title screen. I (Tomato) am not completely sure, but it appears you could interact with this title screen. Note the village area that is visible on the monitor in the top-left corner. In this picture, you can see Flint speaking with some villagers. The fat man to the left of him appears a lot, he must be important, probably a mayor or something similar. On the right, we see a battle scene, however small this picture may be. As you can tell, this particular battle background looks very trippy. I hope that Mother 3 has more crazy backgrounds than Mother 2. That was one of my favorite parts of that game. Here we see 2 more battles. Well, only one full battle, and a half of another. The battle on the left looks like you're fighting some kind of boar. In the upper right corner is a tiny text box asking "What will you do? 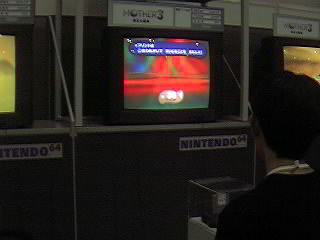 ", which is a prompt asking the player to choose a battle command. These commands are found on the brown menu thing on the left. 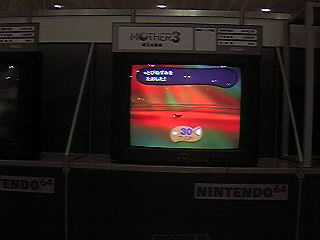 The pink thing on the bottom is a status bar, as found in Mother 1 and Mother 2. It just looks fancier this time around. 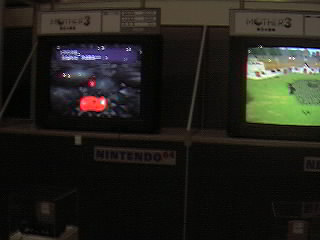 The screen on the right is an item screen being accessed during a battle scene. Although you can see items you have, you couldn't use them in the demos. You also couldn't use the "Magic", "Speak", and "Call" commands in these demos. 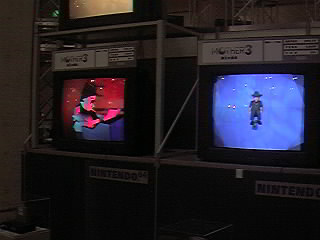 In the screen on the left we see Flint running around. 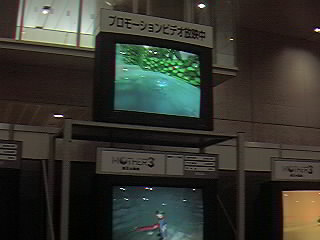 On the left is a battle scene, where whoever was playing didn't do so well. Their HP dropped to 0, and they "died". I don't know if people officially die in this game or merely become unconscious. We'll just have to wait and see. On the right we see Flint hanging around the village. Yes, this screenshot shows what it says after you win a battle. Sometimes it will say "You learned something important" or "You grasped/gripped something." Please note, those lines are not easily translated, so they probably don't mean what you think they mean. Except maybe the learning thing. I never get tired of that word. Anyway, this particular battle features some radical color background thing-a-majig. This is an introductory battle with a "Pig Mask". You're supposed to be able to hit really hard if you press the button at the exactly the right point in the music, but it's kind of hard. Here we see another battle. If you can get a head start attack on an enemy, the screen is tilted. "You defeated the Flying Rat." Wow, flying rats! Cool! EXCELSIOR! also mentions Poison Worms. The name of this enemy isn't very easily translated. My best shot is "Somehow This Is A Pig Z" (buta nantoka Z). Judging from the appearance of this enemy, this name makes sense. 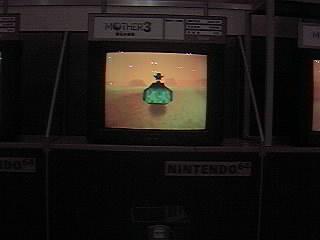 What odd enemies the Mother series has. Apparently, EXCELSIOR! hit the attack button at just the right time in the music while he was fighting this guy, so the enemy was hit around 5 times, for a ton of damage! 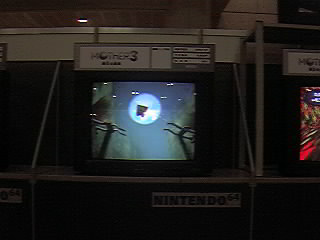 In this picture, the player has "died". Too bad. In this screenshot, we see Flint riding one of those hovercar things. 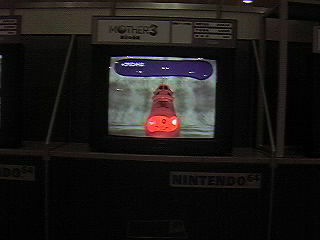 Apparently the music played in this part was reminiscent of the Mother series. 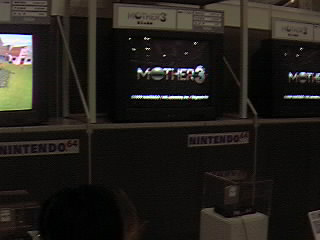 Let's hope more Mother 1 and 2 music shows up elsewhere! Flint is conversing with a villager in this screenshot. 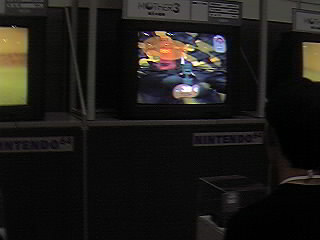 The demo is playable after this point. 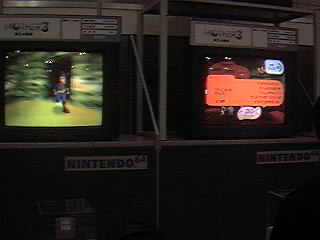 They displayed that demo video on the monitors. They were much more clear, and not as choppy as the QuickTime video found on this site. 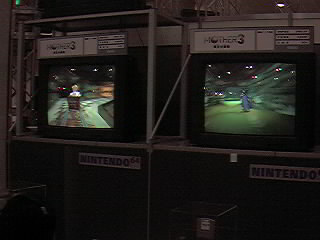 Here, we see the mine cart sequence of the video being shown. I have no idea what's on the right-hand monitor. On the left we see the keyboardist doing his solo. There are guitarists and drums also. Apparently this is a jazz band. On the right is a screenshot of Flint encountering a Flying Rat out in the field. He's snuck up on the enemy. Doesn't this picture remind you of E.T.? On the very right we see somebody in battle, with more funky colors. Here's part of the mine cart sequence. It looks pretty nifty. 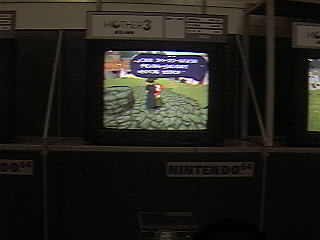 After this part of the demo, the dog, Boney, goes around looking for somebody, I'm not quite sure who, though. 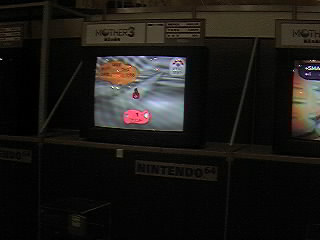 Here we can see part of the demo where that frog-looking thing comes out of the pond. In the monitor below, Flint is about to go into battle with a Poison Worm. I think these worm things were what everybody was calling snakes. Oh No! A Dragon Monster! Here, we see a huge dragon creature running through the forest. We're looking at it through a window of some sort of vehicle, some kind of train I think. Again, I'd like to thank EXCELSIOR! for letting us use these pictures and for letting us use some of the info on his site. If you got any questions, complaints, or whatever, mail me. Only if what you have to say is really really important though. Otherwise, just send your message to the Starmen.Net Mailbag or post your thoughts on our message board. This is Tomato, signing off from Arizona, so that he can get back to studying.